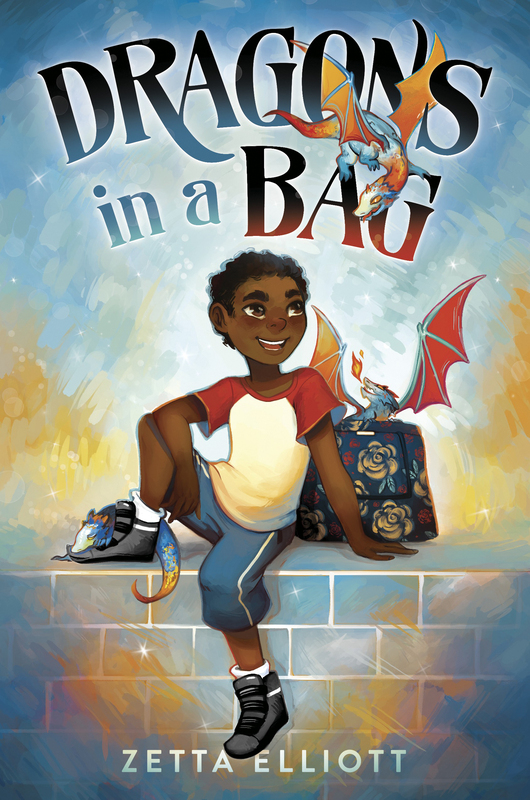 The See What We See (SWWS) coalition is thrilled to introduce the cover for Dragons in a Bag by Zetta Elliott. Random House will release Dragons in a Bag in October of 2018. It is a wonderful middle grade novel, the first in a series, that will leave you clamoring for the sequel. This is the first cover reveal for SWWS and the Social Justice Books website. Just slide the arrow up to reveal the cover. (You can also see it here). Author Zetta Elliott shared with us some background on the book – both the story and the process of writing and publishing it. When I considered collaborating on a cover reveal for the first time, I knew that Social Justice Books was the right “home” for my middle grade fantasy Dragons in a Bag. The cover art by North Carolina-based Geneva B perfectly captures my main character Jaxon’s #BlackBoyJoy, which matters in a moment when Black boys are still being (mis)represented as monkeys and/or menaces to society. Dragons in a Bag takes place in a corner of Prospect Park that’s very close to my own home in Brooklyn, and the plot revolves around the borough’s loss of magic—a phenomenon caused by gentrification. Jaxon needs somewhere to stay while his mother goes to court to fight an eviction order from their landlord. When Jax is left with an elderly Black woman named Ma, he soon discovers that she isn’t related to him at all—she’s a witch! Ma is ready to retire but she has one last mission to complete: deliver three newborn dragons to the realm of magic. When Jax agrees to serve as her temporary apprentice, Ma leads him into the park where a portal awaits. The fantasy fiction I read as a child offered an escape from my own reality, but it didn’t provide the tools I needed to theorize my own experience. Those came much later when I moved from Toronto to Brooklyn at 21 to attend graduate school at NYU. Only then did I learn how to recognize—and at least partly undo—the damage caused by growing up without what Rudine Sims Bishop calls “mirror books.” When I began writing for kids in 2000, I deliberately put kids of color at the center of magical adventures that transpired in their own neighborhoods. I wanted the urban students I taught to know that magic can happen to anyone, anywhere—not just White kids in a castle in England. I also “talked back” to the books I read and loved as a child—books that enthralled me even as they distorted or altogether erased Black children. I wrote Dragons in a Bag during the summer of 2016; I’d found an agent a few months before, but still expected I would have to self-publish the book. It includes an appearance by Vikram Patel, a character from my first City Kids book, which I self-published in 2014 after more than a decade of rejection letters from editors. The City Kids series developed from a conversation with several Oakland librarians who assured me that young readers wouldn’t pick up The Phoenix on Barkley Street unless there were subsequent adventures to read. That didn’t ring true to me at the time, but I’m grateful for the advice because there are now four books in the City Kids Series with a fifth in the works. Dragons in a Bag would have joined that self-published series had my agent not found a home for the book and its sequel, The Dragon Thief, with Diane Landolf at Random House. To my surprise, Diane shared my affection for the books of Brooklyn fantasy author Ruth Chew whose 1978 novel The Magic Cave planted a seed in me when I was an unhappy Black girl in Canada dreaming of a different life. I grew up to write my own fantastic stories and like Chew’s, they take place in Brooklyn and feature local parks, institutions, and landmarks. My investment in reading children’s literature through a critical lens drew me to like-minded scholars, librarians, and bloggers, and together we joined forces to form See What We See (SWWS). It’s not enough to celebrate the publication of books that feature kids of color; each addition to the field needs to be analyzed and assessed by critics who are culturally competent. It’s also important to recognize that the books that end up on our shelves have been curated—selected and shaped by members of an industry that is sorely lacking in diversity. I was fortunate to find in my editor a partner who respected my vision for Dragons in a Bag. For me, fantasy fiction’s purpose isn’t to shield kids from the harsh realities of the world in which we live. Everyone doesn’t get to live happily ever after, but magical tales can inspire and even prepare young readers to challenge the injustice that plagues our society.